The theory of elements is becoming increasingly popular in homeopathy. Patricia Le Roux, an experienced paediatrician from Marseille, demonstrates for the first time the use of this theory in the treatment of children. The popular author describes with uncompromising clarity and simplicity all the remedies of the Iron, Silver and Gold series. She presents each remedy with an impressive case study, followed by an essence for each, as well as the remedy’s key symptoms. The case descriptions range from infections, eczema, asthma, glomerulonephritis, rheumatoid arthritis and anaemia, all the way through to learning difficulties, developmental delays, depression and anorexia. The book’s simple, almost abstract style convincingly conveys a sense that the author ‘lives’ these remedies and one sees how she prescribes with ease and accuracy. After reading this book, one is left eager to apply the methods in one’s own practice. The book really is “worth it’s weight in gold”. “Patricia Le Roux is very good at looking for and finding the essence, in her patients and in the remedies. She has a great talent for incorporating the new theories in homeopathy and elaborating on them. And she has a great talent for successfully applying those theories to her patients. The title essences and paediatric cases is a good description of the contents of this book, but there is even more: how many of us have seen, and helped, sufficient child patients to have prescribed 54 polychrest or rare remedies from this list of metals? Patricia Le Roux has already published paediatric cases of other families: Milks (1), Acids (2) and Butterflies (3). With this book on remedies from metals she boldly enters centre stage, demonstrating real insights into materia medica and case management. Here is a combination at least three schools of homeopathic thinking, the 'minimum symptoms of maximum value' from the French school of Didier Grandgeorge, the use of the periodic table of the elements from Jan Scholten, and the 'sensation method' of Rajan Sankaran. There are some helpful introductory chapters, a reprise of the 'horizontal series' and the 'vertical stages', and a summary of the Iron, Silver and Gold series in turn. The author assumes no prior knowledge of chemistry, I am glad to say. Almost each remedy contains a case description; a few remedies are so rare that they have still not been properly described or prescribed. There is an essence description, and added materia medica from published sources, notably from Scholten, which is obviously the sourcebook for metals. She also uses a great deal of material verbatim from Murphy and others. This is almost my only criticism, in that Murphy's work is itself text taken from other materia medica, and then it is not in the traditional top-to-­toe order of the 'schema'. But on the other hand this adds some useful information to her sometimes scanty, almost experimental initial prescriptions. The remedies being described in series shows how each one is linked to its neighbour in the table. As the remedies are not discussed in alphabetical order, and there are comparisons with other remedies, an index should have been seen as essential and is absent. The translation is excellent. As examples I shall cite the studies of Cadmium and Tellurium. I had only ever prescribed Cadmium for adults (4), I knew of it in connection with influenza, facial paralysis, coldness and cancer, from Grimmer and Gutman as my main srouces. Le Roux gives us an essence of 'a real feeling of impotence, and the vision of a potential artistic future in ruins'. Tellurium I have only ever prescribed in ringworm and stinky discharges from the ear. 'Here we have a remedy for arrogant adolescents, who live in a fantasy world and excel in 'on the spot improvisations'. There are also many useful insights about polychrests like Aurum or Plumbum for children. I have often heard students complain at the dearth of mature books about homeopathy for children. Here is one I can heartily recommend. 1 Homeo et Juliette, Paris, 2005, Publibook. 2 Hydro-Homeopathic Energy. A complete study of the use of acids in homeopathy, Paris, 2004, Publibook. ALSO AVAILABLE ON THIS WEBSITE. (3) Butterflies. An innovative guide to the use of butterfly remedies in homeopathy, Kandern, 2009, Narayana Verlag. ALSO AVAILABLE ON THIS WEBSITE. 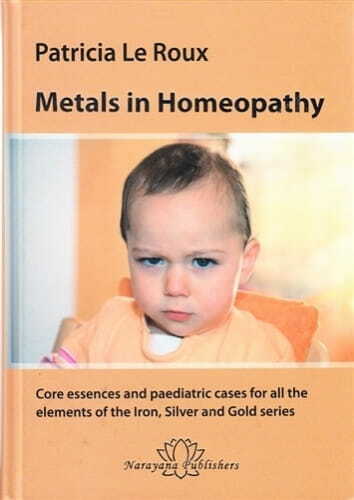 When I got the mail from Narayana Pub­lishers concerning the new book by Patricia Le Roux about Metals in Homeopathy I was very excited, especially because it was illustrated through pediatric cases. Le Roux is prescribing many of the new remedies ac­cording to the homeopathic understanding of the Periodic Table, which is not always easy. I hoped this book would shed light on all the lesser known remedies in the iron, sil­ver and gold series. Le Roux is presenting cases of all the elements of these three rows, which is quite a feat. They are all cases of single elements, not salts combined of two elements, as in simple Kalium, sim­ple Calcium etc. I hoped to get in-depth clarification of the nature of these rarely seen single elements. I am sorry to say that I was disappointed. The book starts with an ultrashort introduc­tion to the idea of the periodic table as an analogue to human stages of development, which is acceptable if you are already well versed in Scholten's (or Sankaran's) ideas. If you are not, you need to read Scholten. This very brief way of explaining concepts runs through the entire book and I think this is a major problem. Three rows times eighteen cases (one for each stage) for rem­edies with relevant materia medica and concepts in 350 pages is quite condensed when trying to explain the prescription and effect of many new and little-known remedies. The cases are ultrashort and the choice of remedy is sometimes explained with only a few lines. Remedies that do al­ready have known materia medica are often followed by pages from Robin Murphy's materia medica, or, if there is no proving, materia medica from Scholten's work. These passages generally take up much more space than the case and analysis. Le Roux is a skilled practitioner and obvi­ously has a lot of clinical experience. I wish that she trusted her own experience and would take time to explain why she chose the remedy and how she sees it. This would have made the book more interesting. Every remedy chapter is concluded with a short resume of the remedy as seen in the concept of the periodic table, written by Le Roux. It includes keynotes and ends with a one-liner conclusion of the "essence" of the remedy, for example: "Antimonium metallicum is indicated when an Antimony profile emerges with a functional metallic dynamic" or "Osmium is a remedy for children who are initially lazy, but once they get going they'll move mountains", or "The element Calcium is often useful with children identified as Calcarea carbonica, when the Carbonate radical is less in evidence. "These statements are often very general or too abstract be­cause they are not well explained, so they have no really useful function or effect as to the readers' understanding of the sub­ject. Most of the cases presented have extremely short follow-ups that only continue a few months after the first prescription; nor­mally a much longer follow-up period is required to document a good prescription. Some cases are not convincing at all, like the Vanadium case where the patient has a severe aggravation after the first dose and is hospitalized, then Lac caninum is pre­scribed and when she returns the following year she is better. This is not even a full analysis and with an understanding of the case and the remedy, this book would have been useful. I am sure she has the knowledge. It seems as if she was in a hurry to put the book together and had the fixed idea that she had to present a case of all the single el­ements, even if she did not have good cases for all of them. Le Roux chose to present as many short cases as possible followed by fairly one-dimensional essences and dry materia medica lists in a powerpoint pre­sentation style and pace. Unfortunately there is no synthesis of the disparate facts. What kind of book did she intend? A com­pilation of old materia medica explained in the context of the new understanding of the elements or a solid and practical case-based presentation of Scholten's theories? Both would have been great, but this is unfortunately neither.